Photo: Forever Geek Playtesting is an essential part of any game’s life cycle, giving designers a chance to see what works and what doesn’t. Necessarily, that means We Didn’t Playtest This At All is deeply broken, heinously unfair, and profoundly wonky -- but that doesn’t mean it isn’t a blast. 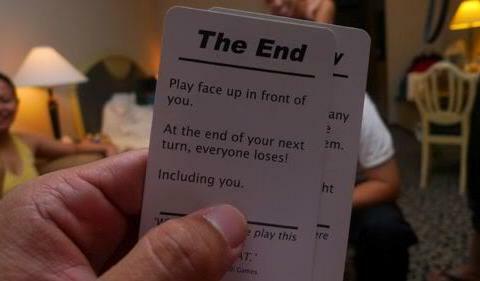 Every player gets two cards, drawing and playing one during each turn. That’s about as deep as it goes, because with cards like Dinosaur (“Place in front of you. You have a dinosaur. Nobody else has a dinosaur”) and I Lose (“If you play this card, you lose”), strategy isn’t really a factor. But who needs strategy when you have a dinosaur?